Shadowrun 5th Edition may be gratifyingly huge, but that comes at a price: it’s one of the crunchier RPG systems out there, to the point where some may find it a bit unapproachable. To my tastes, it’s at the point where if it were a bit more crunchy I’d be disinterested, and as it stands I would rather not engage with the system for the purposes of a quick one-shot game because the effort involved in engaging with it would be enough that it doesn’t quite feel worth it for a game that brief. In principle, then, I was very interested in Shadowrun: Anarchy, a game which adapts the rules-light Cue System to Shadowrun and thereby offering a setup where character stats resemble truncated versions of the full-fat Shadowrun equivalents, allowing you to strip-mine existing Shadowrun supplements for source material whilst sticking to the lighter rules system offered here. The issue with the book is that I kind of feel like it’s misread what people actually wanted on this front. Whilst plenty of people down the years have expressed a wish for a more rules-light take on Shadowrun, what I think most of them actually wanted when they expressed that wish was, in fact, a rules-light take on Shadowrun – namely, a system which would support the same traditional RPG experience that Shadowrun is good at, just with far less fiddly bits. What Catalyst Game Labs seem to have interpreted this desire as is as a desire for some sort of narrativist indie game which made at least a token bid to break out from the classic traditional RPG format into some sort of shared storytelling business. The problem with this is that Catalyst talk up the narrativist potential of the Cue System a lot, but ultimately either don’t seem to have much of an idea of how to design a narrativist system or deliberately decided that it was easier just to not bother doing that but then loudly claim that they did. The game puts a lot of effort into providing you with stats for character attributes, profiles for weapons and equipment, and providing a task resolution, all of which are specified in a manner which feels more appropriate to a fairly rules-light traditional RPG. There isn’t actually any game mechanics associated with controlling who gets to actually narrate – the group just takes it in turns, with the GM stepping in to prompt the next person to start narrating and otherwise having some fiat powers over the order of narration or when you can go into “talk time”, which is used for IC conversations and planning and other situations where having everyone take turns going around the table to talk wouldn’t especially make sense. You can spend plot points to make major changes to the narrative and establish major things, but this mechanic feels rather like an afterthought. In fact, it’s shockingly (and pleasingly) simple to just dial back all the narrative stuff altogether and just run Shadowrun: Anarchy as a traditional RPG – in fact, the book gives you pointers on doing so, you just stop sharing the narration and limit what plot points can do so that they act more like luck points/hero points in other games. What’s irksome is the way that Shadowrun: Anarchy assumes that the full-fat narrativist variant will be the default of how people use the supplement, when in terms of the design of the game it would seem much more natural to assume the more traditional format and have ways to drift the game in a more narrative direction tucked into an appendix. Ron Edwards in “brain damage” mode would argue that this is because the folks at Catalyst Game Labs have damaged their brain and can’t work out how to do storytelling, but Ron Edwards can go jump in the sea as far as I’m concerned. I am more inclined to think that the Catalyst folks simply know what they are good at, and what they’re good at is designing games in a more traditional style than Anarchy claims to offer – but they also know that the more they hype up the difference between Anarchy and traditional Shadowrun, the more eyeballs they’ll get on Anarchy that otherwise wouldn’t have given it a chance. In terms of providing tools for the sort of game Anarchy is pretending not to be, though, it’s pretty good. It still feels Shadowrun-ish because you are still rolling dice pools and some of the stats are broadly comparable. The setting material here is pleasingly brief, offering a much more terse and easy to grasp intro to the setting than the rather longer and more detailed stuff in the big book. The conversion rules mean that the entire fifth edition product line is your playground. As well as providing an easy, brisk character generation system, there is a huge mass of sample characters offered, along with a large number of plot seeds tailored to be played through in a couple of hours. 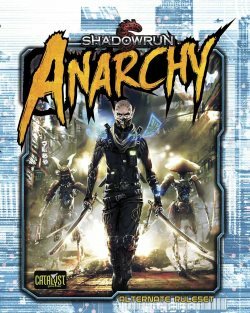 In short, in terms of providing a take on Shadowrun which is good for spontaneous one-off games, Anarchy is excellent. In terms of providing a narrativist story-sharing experience, it reads like it was designed by someone who had heard about storygames second hand but hadn’t actually studied any in detail.